Follow the Lee Gardens area's official WeChat account for the latest promotions and events. Scan the QR code and subscribe now! With the grand opening of Hysan Place, located in the heart of the Lee Gardens Area, an exquisite new vision of Causeway Bay has been created. Expect the unexpected as you explore from Yun Ping Road to Leighton Road, in what has already become the trendiest shopping destination in town, featuring contemporary fashion and premium beauty, culture and lifestyle brands, and the finest cuisines from all over the world. Brand New Concepts and Brands: Exclusive to Hysan Place in the Lee Gardens Area, an exciting variety of overseas brands and new concept stores are making their very first appearance in Hong Kong, offering stimulating new shopping experiences in Causeway Bay. T GALLERIA gathers a magnificent collection of select products, ranging from 50 leading beauty brands to a dazzling assortment of internationally renowned watches and jewellery. In-store advisers are waiting to to offer their expertise and guide you through the unique world of luxury and beauty that is T Galleria. Jasons FOOD & LIVING is a brand new boutique purveyor of fine groceries, offering a unique range of foods, confectionery, spirits and kitchenware from around the world, including over 800 items which can only be found at Jasons. New to Hong Kong, Eslite is a bookstore specialising in arts and humanities titles. It includes a reading room, a kid’s library, stationery shop, tea shop, café, lifestyle section and more in its spacious 3-level store in Hysan Place. The 6th level of Hysan Place belongs exclusively to Garden of Eden, a special retreat designed just for the ladies and showcasing items specially favoured by women, including over 20 brands of lingerie, accessories, nail art, beauty and desserts. Taking inspiration from the legendary Garden of Eden, interior designer Alex Choi created a lush secret garden of visual delights, including leaf-patterned ceilings and floors, apple and tree ornaments, python-print wallpapers and more, as a dedication to all that is gloriously feminine. Premium Flagship Stores Collections: In just one short street between I.T. Hysan One, Leighton and Lee Theatre, there are more than 10 international fashion brands on offer – including I.T and G-Star, the largest flagship stores in the world. Staying on top of the latest fashion trends has never been so easy! Glamorous Brands for Refined Tastes: Located at Hysan Avenue, Lee Garden One - Six is a treasure trove of top international luxury brands like Louis Vuitton, Hermes, Chanel, Dior, Gucci, Moncler, Roger Vivier, Valentino, Ralph Lauren, Tory Burch, Cartier, Van Cleef & Arpels, Bulgari, Piaget and more. These spacious multi-level stores have been designed to offer a supremely comfortable shopping experience, with beautifully spacious interiors and a unique ambiance. Coupled with the sheer variety of products offered, it makes Lee Gardens the destination of choice for discerning shoppers. Hong Kong’s celebrities are always at the forefront of new trends, and they know where to find the hottest shopping destinations. 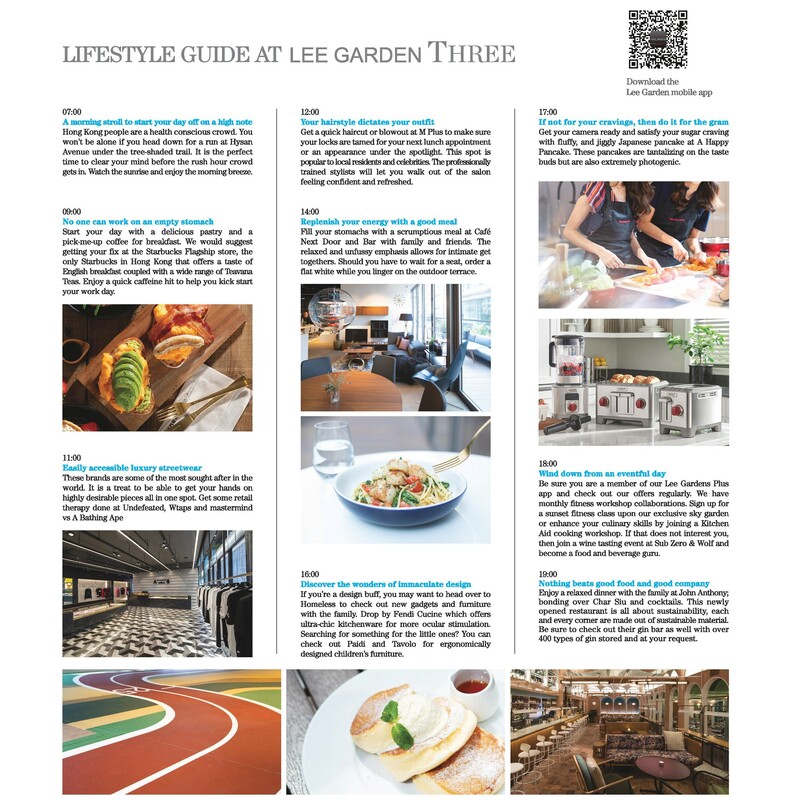 Located in the heart of Causeway Bay, the Lee Gardens Area offers top international brands, making it a natural hang-out for the fashionable and the famous. Come experience your own elegant lifestyle in the heart of Causeway Bay. Lee Gardens is filled to the brim with places to shop, eat and enjoy experiences that are one-of-a-kind. With this expert guide, you can make the most of your time when you’re here. Daily 7:50am – 8:03am, catch the ceremony of the official daily flag raising at Golden Bauhinia Square. Based on a monthly schedule, the ceremony will be performed by Hong Kong Police officers or different local youth groups, while on special festive occasion, it will include special performance. For more tourist attractions and information: please click here . The Peak is one of the most popular attractions in Hong Kong at the same time among the best spots to have a bird’s eye view of the majestic night scene of Victoria Harbor. Lions View Point Pavilion, viewing terrace at Peat Galleria, as well as the Peak Tower Sky Terrace also offer great panoramic vista. For more tourist attractions and information: please click here. A touring activity specially recommended by Hong Kong Tourism Board. It is a large-scale multimedia show of laser beams, colored lights and searchlights that highlighting the waterfront buildings across the Victoria Harbor. The show has been named “The World’s Largest Permanent Light and Sound Show” by Guinness World Records. Nestled in Hong Kong's vibrant commercial and shopping district, it renders easy access to major landmarks and attractions. Our 263 guest rooms and executive suites ranging from 34 to 84 sq. m. in size offer plenty of space, convenient access and a spectacular city or Happy Valley Racecourse view. Guests can enjoy ultimate comfort and rest assured that everything they need for a successful and fruitful trip is prepared. The Excelsior hotel is one of the island's most famous hotels for travellers looking to explore the energetic entertainment and shopping areas of Causeway Bay with a prime location overlooking Victoria Harbour and the luxury of 34 floors with spectacular views. Lanson Place Hotel combines elegance, style and convenience in equal measure. The boutique hotel is tucked discreetly around The Lee Gardens corner. It's the first hotel in Hong Kong qualified as one of the "Small Luxury Hotels of the World". Explore and experience how Lanson Place Hotel is a heaven from the modern metropolis outside. The Park Lane Hong Kong is perfectly next to Causeway Bay MTR and shopping malls and it is the only hotel in Causeway Bay recommended by Michelin Guide Hong Kong & Macau 2009 & 2010 as "Top Class Comfort Hotel". The hotel has 4 restaurants and bar. Function Rooms are also available for meeting and conference. Situated in the heart of Causeway Bay, the deluxe five-star Regal Hongkong Hotel is the epitome of luxury and elegance where international business and leisure travellers are pampered with stylish comforts. Contemporary amenities and impeccable service in an opulent Baroque setting, the hotel offers a series of refined function rooms befitting all kinds of conferences and banquets.